This 2012 Audi A4 Avant wagon is available in three trims namely the 2.0T Prestige, 2.0T Premium Plus, and 2.0T Premium. The 2.0T Premium Plus and the 2.0T Prestige have a lot more features than the 2.0T Premium including the HomeLink remote transmitter, Driver memory, Audi music interface with iPhone and iPod integration, heated front seats, and Bluetooth for mobile phones. The 2.0T Prestige also has additional features such as Audi side assist airbags, rear acoustic parking sensors, and the Audi MMI Navigation plus. Some similar features between all three trims are power front seats with driver lumbar support, leather seating, and a multi-functional leather wrapped steering wheel. The Premium Plus and Prestige trim packages both have three-zone automatic climate control and 10-spoke, 18 inch alloy wheels mounted on all-season tires. The 2.0T Premium only has a single-zone automatic climate control and a 10-spoke 17" designed alloy wheels, also equipped with all-season tires. In terms of headlights, the 2.0T Premium has daytime running lights combined with Halogen headlights with; the 2.0T Prestige has the Audi xenon headlights with LED daytime running lights, while the 2.0T Premium Plus has the Audi xenon plus headlights with integrated LED daytime running lights. 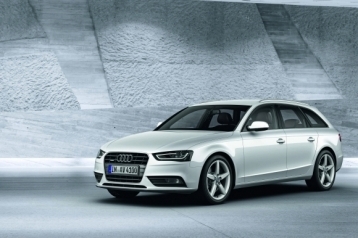 The 2012 Audi A4 Avant wagon is a very safe vehicle to drive. The Electronic Stability Control (ESC), innovative braking system, six airbags, the seat belt pre-tensioners and high impact crumple zones protect you and your loved ones. The ESC keeps the Audi A4 planted to the road by moderating the ABS, and traction control of modules. Another important safety feature that the A4 Avant wagon promotes is a reduction to the likelihood of a whiplash injury occurring during an accident due to its uniquely designed head restraints. The crumple zones also come in handy in this regard as it limits the impact of a collision to the driver and passengers seated in the wagon. Crumple zones are found at the front and rear of the Audi A4 Avant, and the frame is constructed using high strength steel. Any potential car buyer considers the car manufacturer's history and brand image. When a consumer considers an Audi, they know the design and engineering has been tested on one of the most grueling racetracks in the world, The Nurburing. Not only that, but the car was designed to handle the equally famous Autobahn public highway. While most of these car sent to America will never see the type of abuse they were designed for in Germany, you can be sure your Audi is capable of anything you can throw at it.